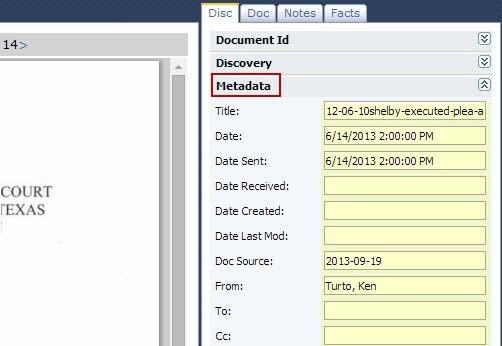 The metadata section is part of the Discovery Tab in the Document Viewer page and it allows you to identify documents for a discovery production and displayed within Lexbe eDiscovery Platform in the discovery production job. While looking at a document you can edit the general tag data. 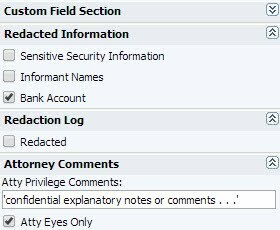 Also, You can enter information needed for the privilege log. Please note that only Admin Users have the ability to edit the 'Disc Tab' whenever you select a document by clicking on any link to the document in Lexbe eDiscovery Platform, such as from the 'Search', 'Browse' or ’Facts & Issues’ pages. The custom Sections you set up will be visible to all users, and you can click the down arrow next to a section to expand it to see the contents. You can code the documents (check-boxes and text boxes), and then save as part of the coding process. All the changes made into the discovery tab can be either saved or cancelled. You just to click on the words located at the right top corner of the screen. When new custom coding fields are added to any document uploaded into your Lexbe eDiscovery Platform account, these coding fields will be also displayed as subsections under the Discovery Tab from the Document Viewer. Custom coding fields are organized into expandable sections.You should first set up one or more sections to contain and organize your fields. Examples of section names could be 'Redacted Information' 'Attorney Comments', etc. This action will display the new coding section in the main screen of the 'Custom Field Section'. To create fields under the new Coding Section, click on 'Add Coding Field' from the upper left corner of the screen and again a new window will be opened in order to create the options for the coding section. To view the new Coding Section and Field(s), click on any link to the document in Lexbe eDiscovery Platform, such as from the 'Search', 'Browse' or 'Facts & Issues' pages. NOTE: All fields must be located under a section or the fields will not display on the document viewer. The Admin User(s) may add or delete a custom coding field/ section at any time, just click on 'Edit' or 'Delete' buttons located in main screen of the 'Edit Custom Coding Fields' under 'Manage Custom Doc Field'. When deleting any coding field or section, this action cannot be undone.